No criminal proceedings are to be brought against a cheese manufacturer over an E.coli outbreak in which a three-year-old girl died. The Crown Office said South Lanarkshire-based Errington Cheese would not face prosecution over the child's death in September 2016. 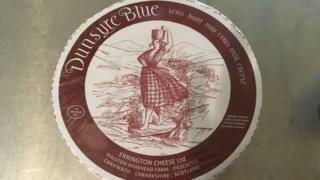 The decision comes after the firm's Dunsyre Blue was named the most likely source of the outbreak. Prosecutors said a Fatal Accident Inquiry was still being considered. The company's owner, Humphrey Errington, said it would be inappropriate to comment at this stage. A report published by Health Protection Scotland concluded in March this year that the source of the infection was consumption of an unpasteurised cows' milk cheese. The company won a court ruling in January against South Lanarkshire Council, which had imposed a ban on the sale of some of the firm's cheeses produced from ewes' milk. A spokeswoman for the Crown Office said: "On 2 September 2016 a three year-old Dunbartonshire girl died as a complication of an E. Coli infection. "After giving the case careful consideration, Crown Counsel have concluded, based on the available evidence, that there will be no criminal proceedings brought as a result of the death. "Should additional evidence come to light that decision may be reconsidered. "The family have been informed of this decision. "A decision on whether or not to hold a Fatal Accident Inquiry is currently under careful consideration."